I got a new silicone mold for filled petit fours (if I misspelled, I’m sorry…sudden brain fart lol, and app doesn’t do the save and come back very well, so please bear with me *grin*). 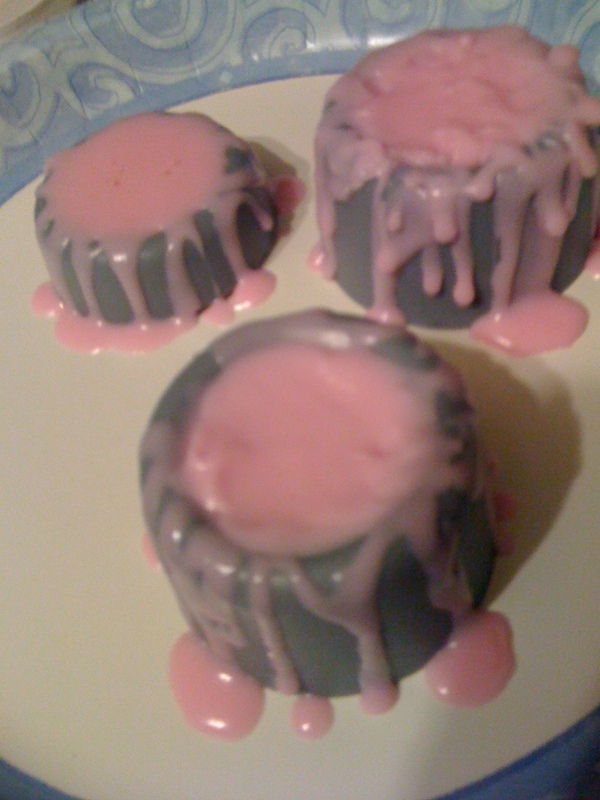 When I saw the mold I immediately thought of mini cake soaps with drizzled “frosting”. I obviously am having trouble getting a decent chocolate cake color (if the clear glycerin version comes out right I’ll post it, but they’re setting up right now). In my mind I pictured little chocolate cakes and what looks like strawberry compote on it and a glaze drizzled down the sides. I experimented with different techniques on each of these and seriously don’t care for the “jam” texture that the soap allowed. I think I’m going to go with the clean version (the small one in the back). I made little black ones in hopes that they’ll look like devil’s food cake, since the bases are not turning brown despite multiple attempts at coloring. I think it’s still a cute soap (not as a grey soap of course) even though it doesn’t have the adorable molten lava cake I see in my mind’s eye. I’m debating doing a small pour onto a cookie sheet and trying to make little balls after the first set up. Put them in the little filling dip and do the other topping pour over that, so maybe I can get a neat texture. At least they’re amusing! I definitely will change the scent profile though. Somehow it smells only like strawberry chapstick instead of chocolate and strawberries. *grin* An amusing challenge! Thank you so much! I’ll post a pic of the new ones hopefully this afternoon. This new batch is super dark and I think with a bright frosting they’ll look neat. : ) I found some cheap but really cute decorative hinged tins. I’m going to try to fit a cake and another little cute or complimentary product in it. Ready to give that way, just needs a tag. I want to see if people like packaged little gifts. Keeps the contents a complete surprise as long as it isn’t opened, and cheap enough to be a cute hostess gift or gift swap.